Following the tragic terror attacks in Brussels Tuesday that have killed 34 and injured at least 187 people, Twitter and Instagram have been flooded with what might seem like an unusual show of support: images of the cartoon character Tintin, often accompanied by the hashtag #JeSuisBruxelles, or "I am Brussels. 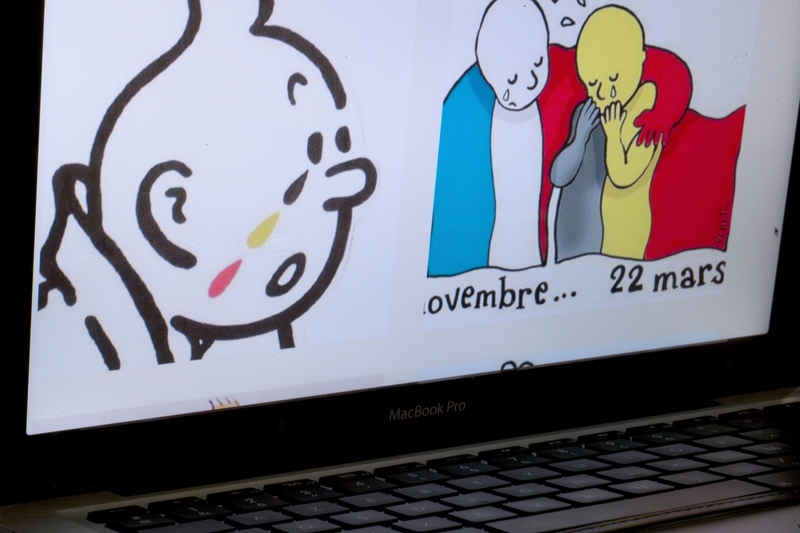 "But why is Tintin a symbol of Brussels in the first place? The answer is actually pretty simple. Tintin was created by Belgian cartoonist Georges Remi, who wrote under the pen name Hergé and published The Adventures of Tintin from 1929 to 1976. If you're not already familiar, the series follows Tintin, a young Belgian investigative journalist who, along with his dog, Snowy, was always saving the day. Because the character is beloved around the world but was created in the small county, he's long been viewed as a national icon and a (albeit fictional) hero. After all, the series was one of the most popular European comics of the 20th century, and has been published in more than 70 languages, with sales of more than 200 million copies. It makes sense that in the country's darkest moment, he would emerge as a symbol of mourning, as well as hope and pride. In the images circulating on social media, it's not like Tintin is just going about his normal business, either. He's been most often depicted crying tears of black, yellow, and red — the colors of the Belgian flag — along with the hashtag #JeSuisBruxelles. In some tributes, Tintin is depicted coming to the rescue. Even Tintin's official handle tweeted a raw response to the attack. In one particularly sad image, Tintin turns to Captain Haddock, another character from the series, and says, "Me too, Captain, I sometimes think about moving to the moon." Check out some more depictions below, and find out how to help victims of the Brussels attacks here.